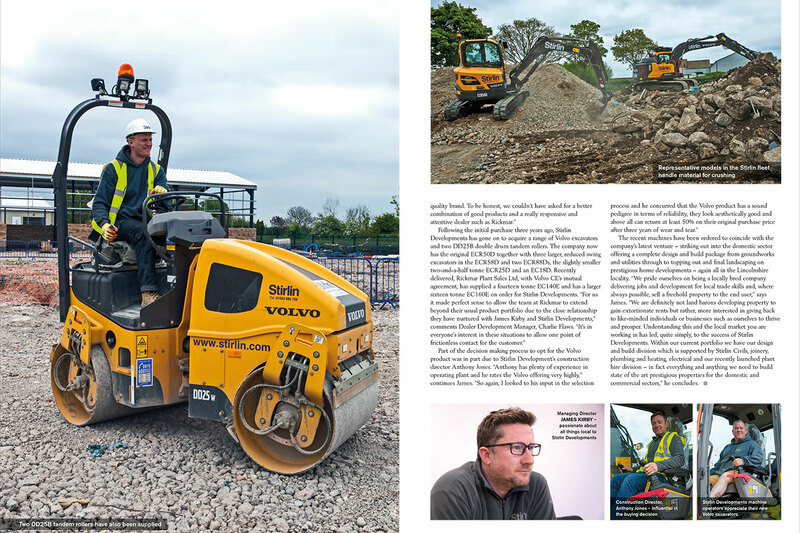 Stirlin Civils were delighted to be the subject of a recent article by Volvo for their ‘The Voice’ magazine. The team were joined by our Managing Director, James Kirby, and Construction Director, Anthony Jones, on site at Riverside Enterprise Park to discuss the history of the company, our growing fleet of machinery, and our ambitions for the future. 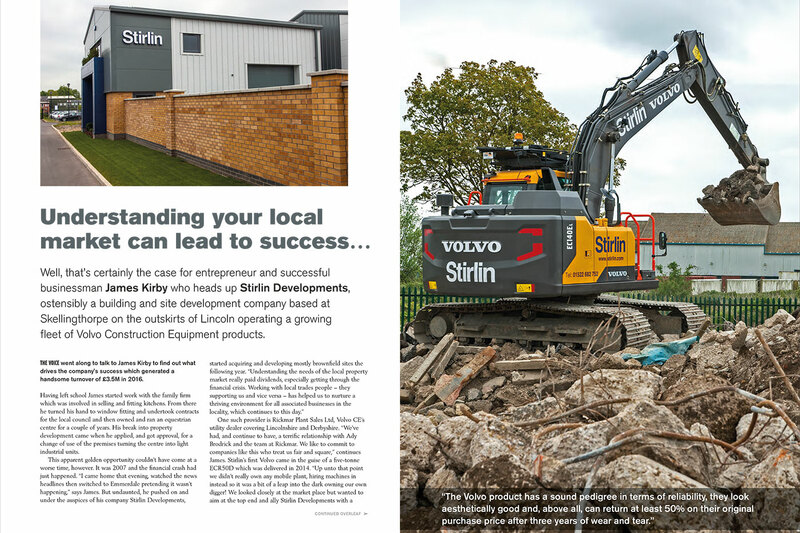 Well, that’s certainly the case for entrepreneur and successful businessman James Kirby who heads up Stirlin Developments, ostensibly a building and site development company based at Skellingthorpe on the outskirts of Lincoln operating a growing fleet of Volvo Construction Equipment products. Having left school James started work with the family firm which was involved in selling and fitting kitchens. From there he turned his hand to window fitting and undertook contracts for the local council and then owned and ran an equestrian centre for a couple of years. His break into property development came when he applied, and got approval, for a change of use of the premises turning the centre into light industrial units. The recent machines have been ordered to coincide with the company’s latest venture – striking out into the domestic sector offering a complete design and build package from groundworks and utilities through to topping out and final landscaping on prestigious home developments – again all in the Lincolnshire locality. “We pride ourselves on being a locally bred company delivering jobs and development for local trade skills and, where always possible, sell a freehold property to the end user,” says James. “We are definitely not land barons developing property to gain extortionate rents but rather, more interested in giving back to like-minded individuals or businesses such as ourselves to thrive and prosper. Understanding this and the local market you are working in has led, quite simply, to the success of Stirlin Developments. Within our current portfolio we have our design and build division which is supported by Stirlin civils, joinery, plumbing and heating, electrical and our recently launched plant hire division – in fact everything and anything we need to build state of the art prestigious properties for the domestic and commercial sectors,” he concludes.